Crossroads Community Supported Healthcare is seeking a billingual receptionist for our affordable healthcare clinic in Las Cruces. Applicants with Bilingual English/Spanish, with extensive experience with clerical work, medical receptionist and office management are encouraged to apply. The position will begin at 30 hours per week and has the capacity to develop into a full-time position. 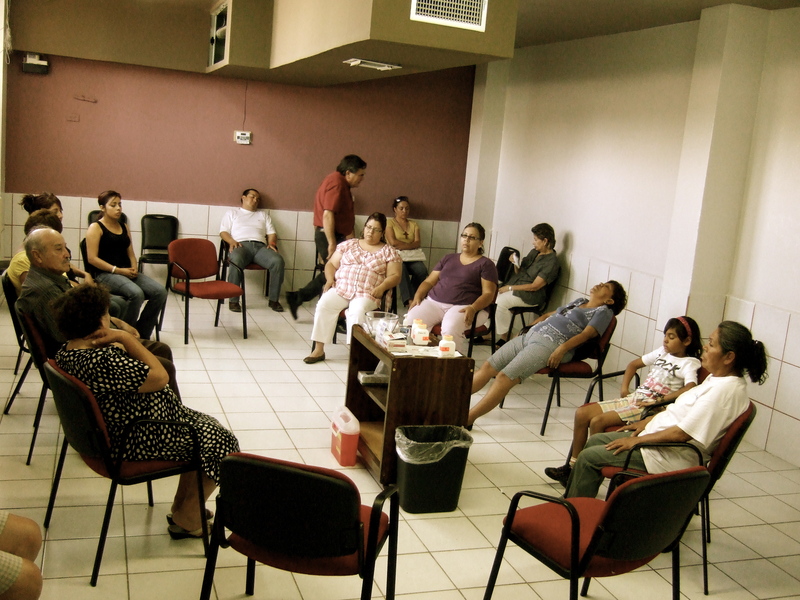 With a mission of providing acupuncture and health services for people of all income levels throughout the region, Crossroads has helped provide more than 25,000 treatments, most in impoverished or underserved areas. On Jan. 1, 2014, howev­er, Crossroads will ring in the New Year, close it’s clinic as a for-profit, and w new non-profit organization will re-open as Crossroads Community Supported Healthcare, a non­profit, al­lowing them to further their goal of providing affordable health ser­vices to, truly, everyone. Crossroads founder and acu­puncturist Ryan Bemis first gained an interest in acupuncture while working in Portland, Ore.
Bemis was immediately im­pressed with the efficacy of the treatment, known as “acude­tox” or the NADA (National Acupuncture Detoxification Association) protocol. His interest piqued, Bemis began studying acupuncture, going on to earn his master’s degree from the Oregon College of Oriental Medicine in 2011. 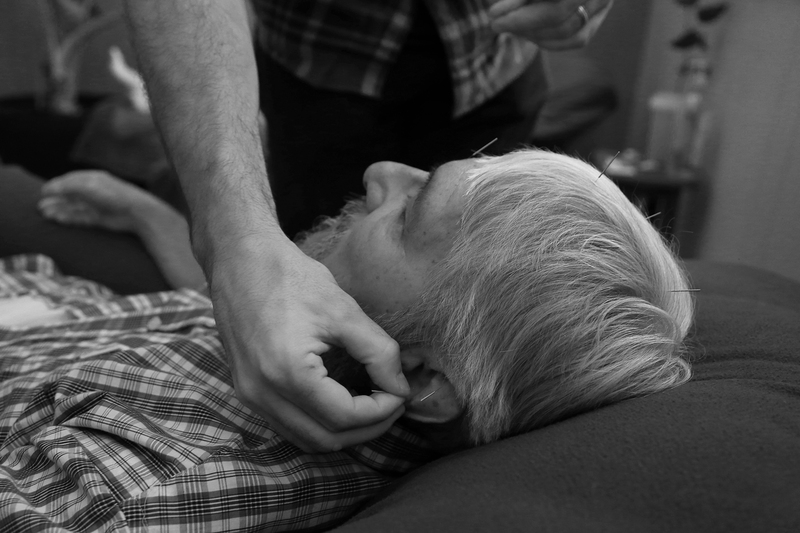 In Portland and throughout the US, Bemis said, there are a number of clinics, like Crossroads that offer sliding-scale, commu­nity acupuncture, as opposed to the more conventional – and more expensive – one-on-one setting. Bemis brought that model to the Southwest when, working on his thesis, he, together with fel­low Crossroads acupuncturist Mateo Bernal started a project in the border region, training practitioners through the Catholic church. 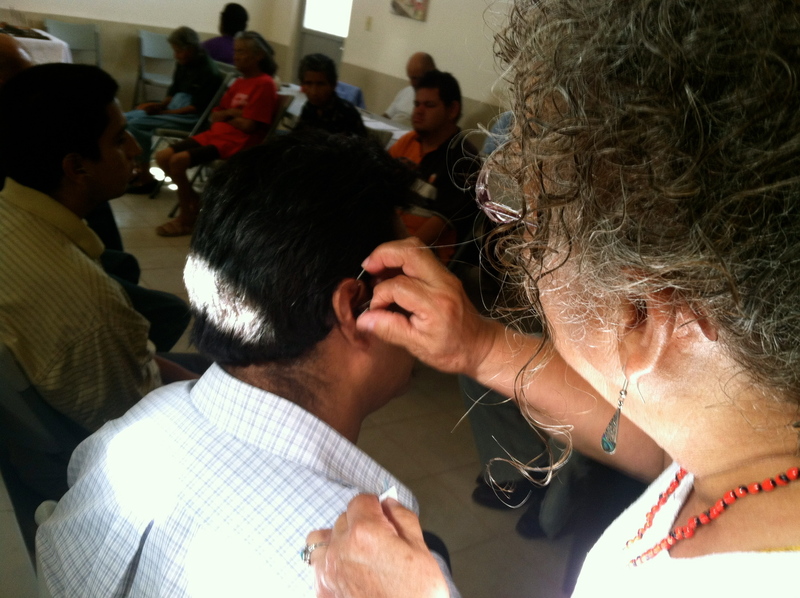 Brought in to support the Catholic church’s response to violence, Bemis and Bernal began training pastoral workers in the NADA ear acupuncture protocol. To date, more than 86 health workers have been trained, most of whom provide free ear acupunc­ture out of their churches and mental health programs. In Las Cruces, Crossroads helped install ear acupuncture services at St. Luke’s Health Clinic at the Community of Hope, where free, walk-in treatments are of­fered every Wednesday from 10 a.m. to noon. 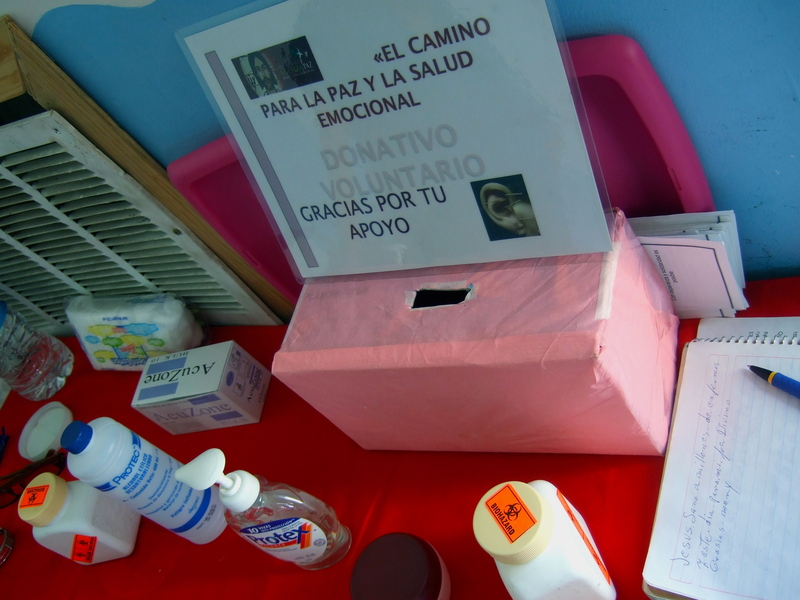 Following the successful start­up of this cross-border project, Bemis opened the Las Cruces clin­ic, which currently sees an average of more than 170 clients a week, for a wide variety of maladies, on a simple, community-minded and cost-effective model. Bemis said people come in for treatment for a multitude of rea­sons, from the small to the dire. Although demonstrated to be very effective in studies from diverse of organizations as the WHO and the U.S. Military, which utilizes staff acupuncturists and NADA-trained psychologists to treat PTSD, Bemis points out that acupuncture is not a magic bullet. To treat a variety of ailments in a large, di­verse segment of the population, Crossroads makes acupuncture affordable with most patients paying between $0 and $20. Relying on the community also allows Crossroads to avoid unnecessary complications be­tween patient and provider. The goal, Bemis said, is not to get rich. “We want people to be able to afford our care,” he said. “Our goal is to serve the community and be able to pay our staff a living wage. Whether steeped in the violence of border cities, or in the relative peace of Downtown Las Cruces, Bemis said, in the end, acupuncture is largely about providing safe space. When we started in 2011, we weren’t sure how all of this would sustain itself. Our capacity building program set forth to empower health promoters working in marginalized communities, in some extremely poor areas in the borderlands. We knew many of the people coming in for treatment would have no money, no job, no opportunities for work. And the programs offering care we knew survived with little to no funding. We feared we, as the organization facilitating training for these groups, might end up having to resort to constant fundraising just to cover the cost of their supplies. We really didn’t want to end up in that type of charity role. Our goal with the Crossroads Border Project*, rather, has always been for each of the health promoters we trained to help their people on their own 2 feet: autonomously, while at the same time being able to aid those who need care the most. It’s now been less than 3 years since we began. We have tracked over 30,000 treatments since then. The majority of these treatments were provided as “donation only.” The health promoters just put a box out in their dispensaries with a label on it: “donativo voluntario” which means “voluntary donations accepted” and added “Para la paz y la salud emocional” translated “For peace and emotional health,” which is what their programs are designed to help with. These little boxes, along with a whole lot of needles paid for through what was collected in these boxes, and their commitment to serving their people, have made it possible…have enabled them to be promoters of peace in places in the borderlands that need paz the most. The donation-based system, which was created by the groups themselves, we have since witnessed, though sometimes just through pesos, has helped them cover their costs. They haven’t had to turn away folks that couldn’t pay. The fact that the funds to carry on the services come from within their community, their services have become self-sustaining. This was important for them: NOT being dependent on outsiders for providing care within their community. Important for us, as well, and one way that makes their programs “Community-Supported” health projects. This is what our mission is all about. On this Saturday, March 8th, we will also offer our services on a donation-only basis, in the same spirit, for the Healer for the Arts festival here in Cruces. We’ll put funds raised directly towards the costs of the Border Project’s two upcoming trainings. Our staff will be volunteering as well on this day (March 8th) to support the Border Project. *Stay tuned this week to KVIA ABC news in El Paso for a report on our project by Angela Kocherga. Most people who come to an acupuncturist for their first time are usually at least a little nervous about “needles.” Even if they don’t admit it. And our culture is just not used to acupuncture or needles as a form of healing. Most of us didn’t grow up in China where acupuncture is in hospitals and part of everyday healthcare. I myself was scared to death of needles as a kid. I had strep throat a lot growing up and would kick and stream each time I had to get a shot. I hated those big needles. The first time I went in for acupuncture I was really hoping they wouldn’t pull out any big needles like that. As our patients know, our approach is very down-to-earth. And our needling technique is very gentle. We use the thinnest needles that you can find. These are probably the tiniest needles on the planet. First time patients at Crossroads walk out of their first treatment pretty darn relaxed, even if they came in with some normal needle nervousness. Out of the 11,000 treatments we’ve provided since we opened in March 2012, I’d say the majority of these people were at one time at least a little afraid to give acu a try. Well, our local cooperative Mountain View Market sent in one of their workers to get a treatment at Crossroads and test us out. They wanted to see just what it is like to be a patient at our clinic and get “poked.” Here you can read their blog: Facing the Needles. Mountain View Member Special: say what? Did you know that Crossroads offers a discount to all first-time Mountain View Coop members? $14 off your first treatment. If you’re interested in giving acupuncture a try, a good time is our upcoming Healer for the Arts event on March 8th 9-3pm. Both Janet and Ryan will be offering treatments as a fundraiser ($10 or more donation suggestion). Funds raised will support the growth of free acu services in the borderlands! We will have limited slots open on this day, so book soon! Call 575 312 6569 to speak with one of our staff about our clinic, and get your chance to get over your needle-phobia. We’d really like to expand our hours, our days, our trainings, and our variety of services at Crossroads. For example, we currently have 2 acupuncturists and 1 massage therapist. Wouldn’t it be great to double the number of providers? Which would mean we could be open every day, and be open just about every evening. You can help us! Please pass on this information about current openings. We’ll be open but will have limited hours on Dec 24,25, 26 as well as Dec 31, and Nov 1. For 12/24, 12/25 and 1/1 we will be offering $10 treatments and annual membership only offered on this day for $800 (Which will give you free acupuncture all year long!). Learn more about our membership program. DEC. 24 10-4 $10 treatments! DEC. 25 11-1 $10 treatments! JAN. 1 10-4:30 $10 treatments! Crossroads Community Supported Healthcare currently sees an average of 150 people per week, and has treated over 25,000 since it opened in March 2012. Currently we’re one of the largest acupuncture clinics in the El Paso/Las Cruces region. We treat people for a variety of health conditions, including pain, stress, anxiety and general relaxation. 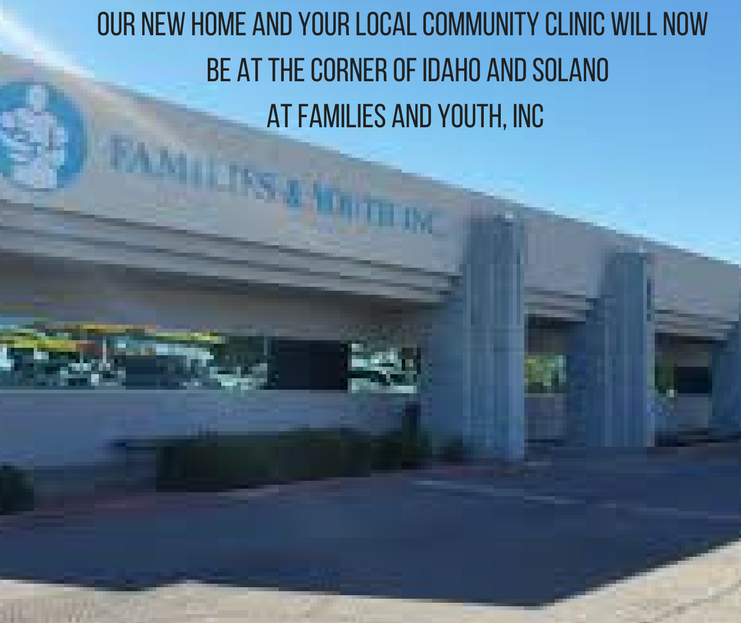 We have solar lit private rooms for all of our providers in a new building at the corner of Espina and University at our new clinic location 901 E. University 945G, on the second floor overlooking NMSU. WHY: Help Crossroads Community Acupuncture raise funds for the non-profit application fee to the IRS. Crossroads is accepting donations throughout the holiday season towards our non profit application. their efforts for peace and healing. 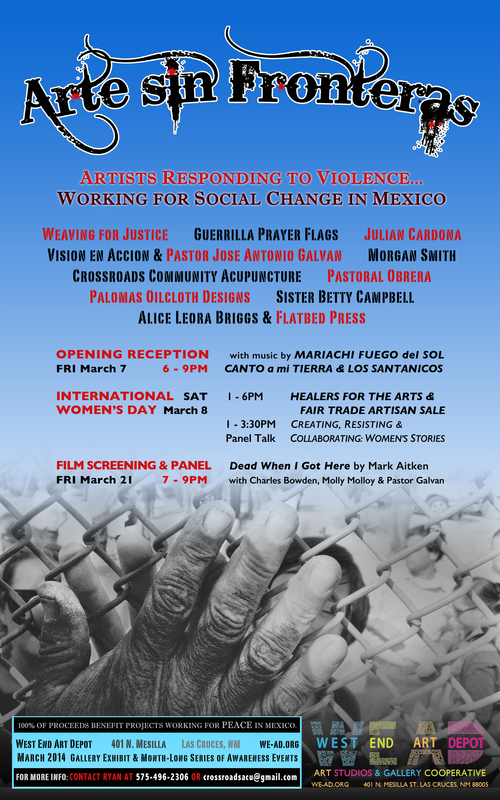 Sponsors: Arte Sin Fronteras is sponsored by a coalition of Las Cruces-based organizations that support peace and healing in Mexico: Weaving for Justice, Molly Molloy and Frontera News List, Crossroads Community Supported Healthcare, Guerilla Prayer Flags, Mas Art, Cinco Puntos. Advance clips from new documentary on Vision en Accion’s shelter for the homeless in Juarez by Mark Aitken. Get a treatment from our new acupuncturist, El Paso native Janet Vialpando, Doctor of Oriental Medicine. Our resident massage therapist Danny Cadena is now on our schedule system. You can also come as a walk in for massage each morning of the week! Massage therapist Felix Galindo will be at the farmer’s market tomorrowmorning at our fair trade booth offering free chair massage. Why: Begin the new year learning Reiki, a Japanese stress-reduction technique that promotes healing through energy work. Learning Reiki will help you reduce stress and anxiety as it promotes calm and healing. What: This one day workshop will teach about Reiki, its benefits, and how to use it on yourself and others. The beginning portion of the workshop will focus on understanding Reiki and its history and then you will be practicing on yourself and others. Cost: only $50 and pre-registration is required by Monday January 27. This is a great deal! Price includes: location, manual, and certificate. Contact: Email, mariposaholistic13@gmail.com or call Paty at 305 396-1389 for more information. Interested in hosting a workshop at Crossroads? Email crossroadsacu@gmail.com to share your ideas! Group counselors, qigong, tai chi and chair yoga are other great community activities that would jive well with our space. Rates start at $10/hour.